Anyone that thinks that the U.S. economy can keep going along like this is absolutely crazy. We are in the terminal phase of an unprecedented debt spiral which has allowed us to live far, far beyond our means for the last several decades. Unfortunately, all debt spirals eventually end, and they usually do so in a very disorderly manner. The chart that you are about to see is one of my favorite economic charts. 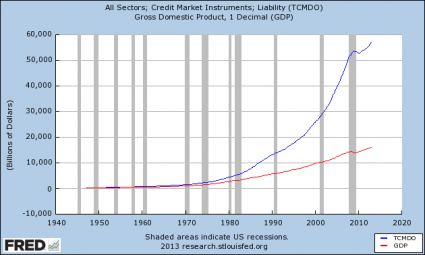 It compares the growth of U.S. GDP to the growth of total debt in the United States. 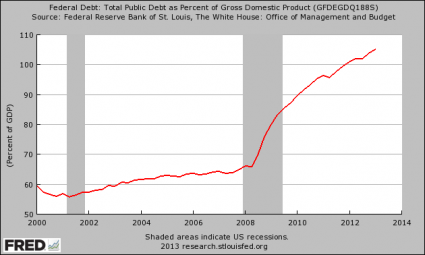 Yes, U.S. GDP has certainly grown at a decent pace over the years, but our total debt has absolutely exploded. 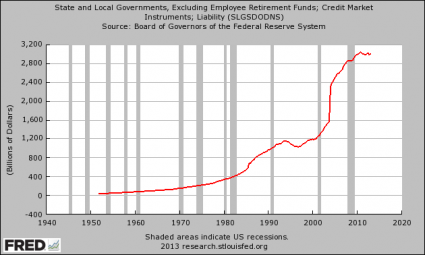 40 years ago, the total amount of debt in our system (government debt + corporate debt + consumer debt, etc.) was about 2 trillion dollars. Today it has grown to more than 56 trillion dollars. Our debt has grown at a much, much faster rate than our economy has, and there is no way in the world that we will be able to continue to do that for long. As I noted in another article, during Obama's first term the federal government accumulated more debt than it did under the first 42 U.S presidents combined. And now we are entering a time period when demographic forces are going to put a tremendous amount of pressure on the finances of the federal government. Early this year, the Pew Center released a survey showing that 61 of the nation’s largest cities — limiting the survey to the largest city in each state and all other cities with more than 500,000 people — had a gap of more than $217 billion in unfunded pension and health care liabilities. While cities had long promised health care, life insurance and other benefits to retirees, “few ... started saving to cover the long-term costs,” the report said.